The revelation of a spellbinding secret sets in motion the most thrilling adventure in the history of Sofia the First! After learning that the Amulet of Avalor is magical, Amber snatches it while Sofia is sleeping. Unfortunately, she unwittingly unleashes a curse that summons evil Princess Ivy, who threatens to destroy the amulet, seize the crown and turn the entire kingdom black-and-white! Amber and Sofia soar through the skies on a flying dragon – aided by special guest Rapunzel – as they embark on a daring quest to defeat Ivy, break the curse and save Enchancia. Packed with high-flying excitement, plus three more song-filled episodes, The Curse of Princess Ivy shows how love, trust, and unselfishly putting others’ needs first can truly work magic! Sofia the First is one of my families favorites because there is always a lesson to be taught in each show. The kids learn from Sofia and actually learn life lessons which is something that we need more of on TV. Sofia the First The Curse of Princess Ivy is a must own for kids everywhere on February 24th! Background Info: Disney Junior’s “Sofia the First” follows the adventures of Princess Sofia, a young girl who is learning how to adjust to royal life after her mom marries the king. Along the way, she discovers that the inner character of kindness, generosity, loyalty, honesty and grace is what makes a real princess. The series holds the all-time record for the top two cable TV telecasts among kids 2-5. 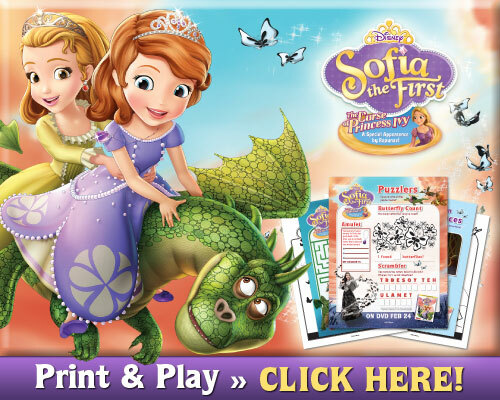 The November 23, 2014 television premiere of “Sofia the First: The Curse of Princess” delivered the series’ #2 telecast of all time and the #1 evening preschool telecast year to date. Cast: Ariel Winter (ABC TV’s “Modern Family”) as Sofia; Sara Ramirez (ABC TVs “Grey’s Anatomy”) as Queen Miranda; Wayne Brady (TV’s “Let’s Make A Deal”) as Clover; and Tim Gunn (TV’s “Project Runway”) as Baileywick. Guest Stars: Mandy Moore reprises her role as Rapunzel from Disney’s “Tangled.” Anna Camp (“The Help,” “Pitch Perfect”) guest stars as Princess Ivy, along with her “Pitch Perfect” co-star John Michael Higgins (“Pitch Perfect,” “Yes Man”) as the self-appointed leader of an all-dragon a cappella group, and Oliver Platt (“The West Wing”) as Enchancia’s oldest-living dragon, Everburn.